Sometimes the obvious is not so obvious. And sometimes the not so obvious becomes obvious. For example installing leaky ductwork1 in a vented attic is a pretty dumb idea (Figure 1). It leads to negative pressures and high air change that depending on the time of year and climate zone results in part load humidity problems, ice damming, excessive energy use, loss of comfort, whatever. If radon were valuable we would mine it this way. Where there is an attached garage we call it the Kevorkian option. Everyone pretty much gets it. Figure 1: Dumb Idea—Installing leaky ductwork in a vented attic leads to negative pressures and high air change that depending on the time of year and climate zone results in part load humidity problems, ice damming, excessive energy use, loss of comfort, whatever. The obvious answer is do not install leaky ductwork in vented attics. Put the ductwork inside or make the ductwork not leaky. Two not so minor issues with this obvious answer. First there is not often room inside because the inside is not “big enough”. Second it is not easy to make the ductwork not leaky. Figure 2: Conditioned Attic—Bring the attic into the house. Some folks call this a “Texas basement”. Both answers work and both have not been easy. We are going to focus on the “bring the attic into the house” part because at the end of the day I think it is a better solution. Of course at the end of the day I also want the ductwork inside the house to also be airtight taskmaster that I am. The typical technology to make the inside bigger is to construct conditioned attics using spray polyurethane foam (SPF) (Photograph 1). We have been using low-density and high density SPF in this way for over 20 years with good success. We have had some glitches along the way (“BSI-077: Cool Hand Luke Meets Attics”) but the technology has been sound. 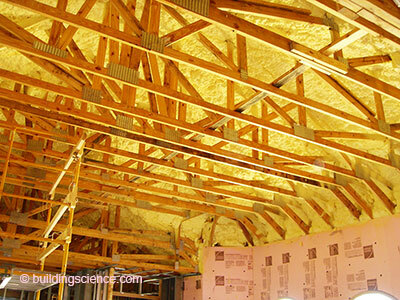 Photograph 1: Spray Polyurethane Foam—The typical technology to make the inside bigger is to construct conditioned attics using spray polyurethane foam. We have been using low-density and high density SPF in this way for over 20 years with good success. So what is the problem? Ah, SPF is not so inexpensive and some folks think it is bad for other reasons.4 Is it possible to do this with other insulation types? No petrochemicals? No fire retardants? No blowing agents? Yes, of course5. See the figures in “BSI-081: Zeroing In—Net Zero Houses” and read the text at the end of that column carefully. Can we go even further? Yes. But before we go there, and we will, we have to take a side journey. To “Failureville” a town that could have been near you. Some of the best lessons come from failures. I like to point out that failure has made me the man that I am today. Success does not often teach as much as failure. Many times we don’t know why something works, just that it does. With a failure, if we study it well, we can learn why and use the understanding to go somewhere we would have never gone. One such instructive failure was the rash of problems with structural insulated panel systems (SIP’s) a decade ago. Who can forget Juneau, AK. 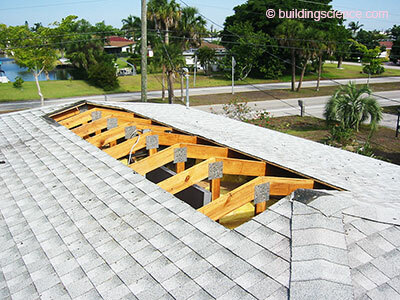 Many dozens of roofs constructed from SIP’s began to fail at ridge locations (Photograph 2 and Photograph 3). 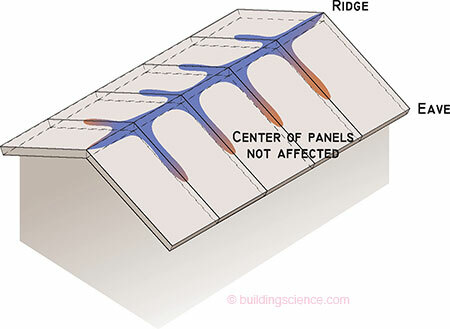 The term “ridge rot” was coined as the failures were concentrated at ridge locations (Figure 3). We looked at this in “BSI-036: Complex Three Dimensional Airflow Networks”. 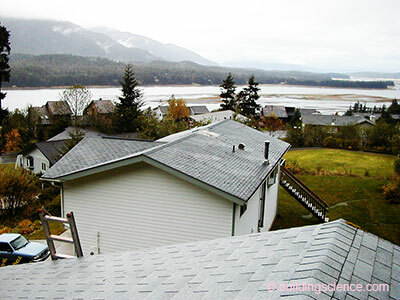 Photograph 2: Juneau, Alaska—SIP roof assemblies in a cold climate where annual rainfall is measured in feet not inches. Photograph 3: Classic Ridge Rot—If you “caught it” in the first couple of years before it spread you could save the roof with a vapor diffusion vent. Figure 3: Ridge Rot—The failures were concentrated at ridge locations. Air leakage from the interior carried moisture laden air to cold surfaces where it accumulated and led to damage. 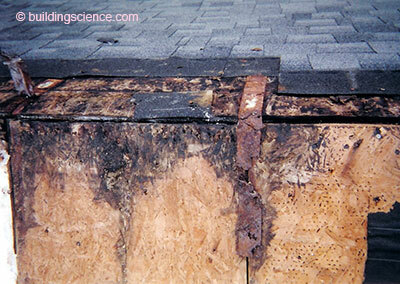 The name “ridge rot” itself led to what was at the time a crazy way to fix the problem. If we can’t prevent the moisture from getting in, but we know where it all ends up, why not get rid of it when it gets there? Obvious but radical. Check out Figure 4. How about a vapor diffusion vent? Not a vent for airflow. No airflow. Just vapor flow in the form of vapor diffusion. Guess what? It worked. Freaked folks out. 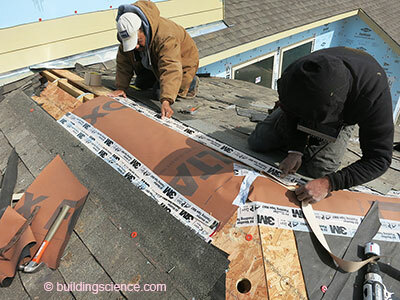 We and others6 have been fixing SIP roofs—and other roofs - all over using this approach. 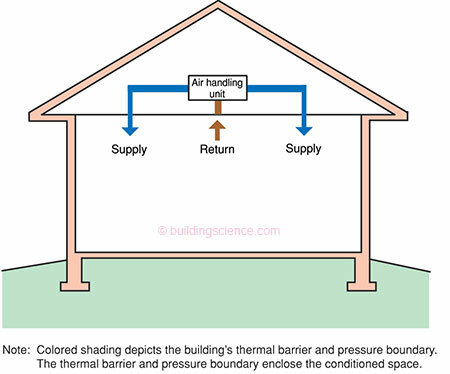 Figure 4: Vapor Diffusion Vent—Not a vent for airflow. No airflow. Just vapor flow in the form of vapor diffusion. We and others have been fixing SIP roofs—and other roofs - all over using this approach. The “fix” worked so well I thought we might be able to turn it into a “solar dehumidifier” to handle part load humidity problems in the southeast. Huh? Sometimes the bourbon, the scotch and the beer make you see things in unusual ways. How about using a hygroscopic material to adsorb moisture from the occupied space and then use solar energy to desorb the moisture to the outside? We played around with such an approach in Ft. Myers, FL a bunch of years ago. 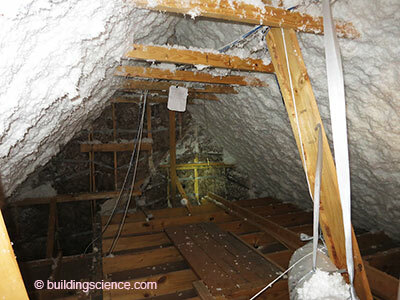 We used cellulose insulation in a typical attic to be our hygroscopic material. We blew a whole bunch over the top of a flat attic ceiling. Made the attic airtight. No soffit vents. Then we installed a vapor diffusion ridge vent (Photograph 4, Photograph 5, Photograph 6 and Photograph 7). 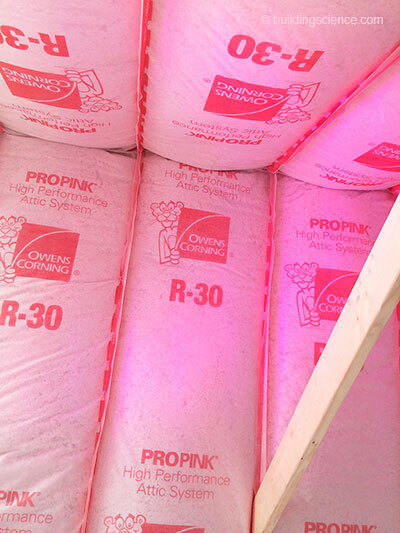 We “charged” the cellulose at night by taking “house” air and blowing it through the attic cellulose insulation. Then we “discharged” the cellulose during the day when the sun warmed the attic space up to 140 degrees F venting the vapor to the outside through the vapor diffusion vent. Photograph 4: Solar Dehumidifier—How big should the vent be? Just guess. Turned out to be twice as big as necessary. Limiting factor was not the diffusion vent area but getting moisture from the house into the cellulose. Photograph 5: More Solar Dehumidifier—Water tight, air tight but vapor open membrane. Photograph 6: Still More Solar Dehumidifier—Not a standard way of doing a ridge vent. Photograph 7: End of Solar Dehumidifier—A glorious attempt. Works well enough to keep the roof from rotting but not well enough to address part load humidity problems in energy efficient houses. So did it work? Well, yes and no. We did remove moisture from the house. And it did leave through the ridge vapor diffusion vent. And we had no moisture issues in the attic. So what was the problem? Well, the amount of moisture removed was not sufficient to dehumidify a well built, energy efficient house with typical occupancy in Florida. Bummer. And I was not comfortable blowing house air through cellulose insulation and then returning it back to the house. Double bummer. Couldn’t get rid of mechanical dehumidification. Still ended up needing an air conditioner or a dehumidifier in the southeast. Back to the drawing board? Yes and no. A huge “ah hah” moment occurred. What is one of the most damaging effects of hurricanes in the southeast, particularly in Florida? Wind driven rain through roof vents. 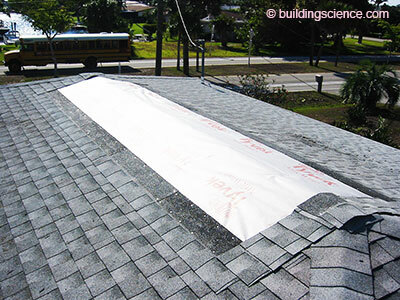 Various estimates of 20-to-30 percent of hurricane water damage occurs through leaking roof vents. Until now, the only way to solve this problem is to not have roof vents. How about sealing up soffit vents and covering up the upper vents with a watertight but vapor open membrane or sheet good? Great retrofit. Easy. Works in new houses. Works in old houses. The solar dehumidifier idea did not pan out, but we sure got a solution to wind driven rain under extreme conditions. Still a code issue. Working on that part. First we get stuff to work, then we get the code to work. It gets even better. In wild fire areas what is the big issue? Embers entering vented roofs carried by air currents. But if you don’t vent the attic, the roof rots. Choose your attic death: fire or rot. You of course can go the full monty and do the traditional unvented roof approach. 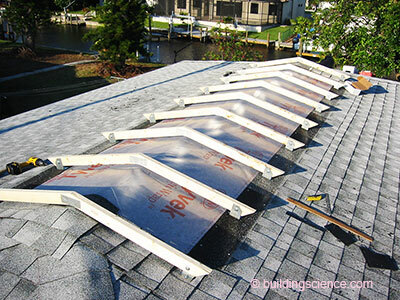 Or you can close your lower vents and then install a vapor open membrane or sheet good covering the upper openings. How about exterior fiber faced gypsum board? This stuff is more than 30 perms. Works. I bet someone out there has a fireproof vapor open membrane that would work even better. Are we done yet? Nope. Just getting rolling. Remember the start of this story? I asked can we go further with unvented roofs? Can we do it with other insulation types? Remember I said we had to take a side journey? Well we just finished the side journey. The result of the side journey is that all the moisture ends up at the ridge. Repeat. All the moisture ends up at the ridge. Not just with SIP’s, but with fiberglass and cellulose as well. We can work with this in new house construction. 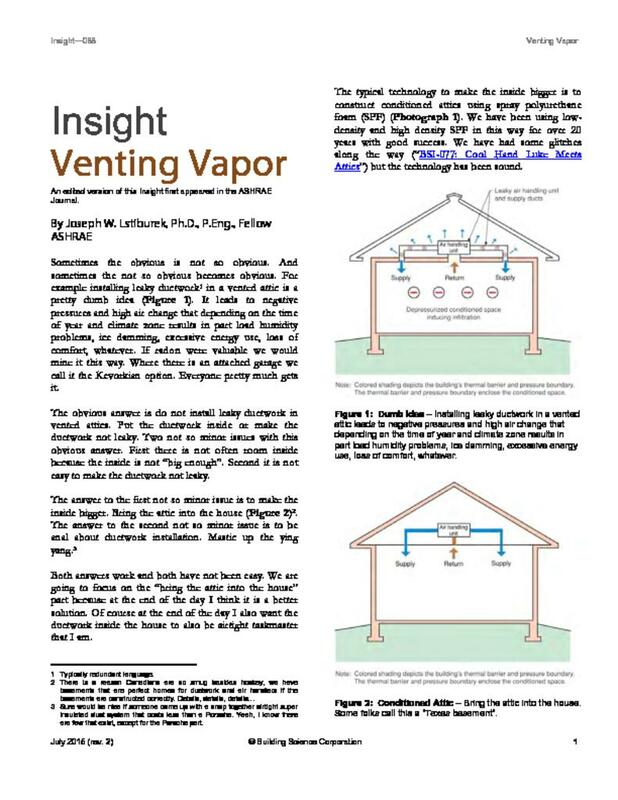 Let’s construct a new house with a vapor diffusion vent at the ridge and with no soffit or lower vents. 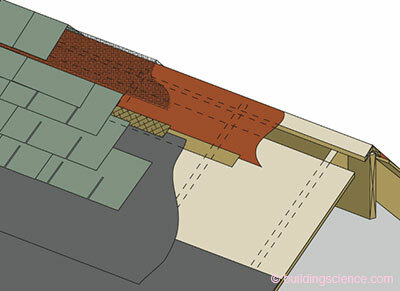 It can be a shingle roof or tile roof—does not matter (Figure 5 and Figure 6). The roof also needs to be sloped. This does not work with flat roofs. Remember the “moisture ends up at the ridge” part. What about hip roofs? Check out Figure 7. 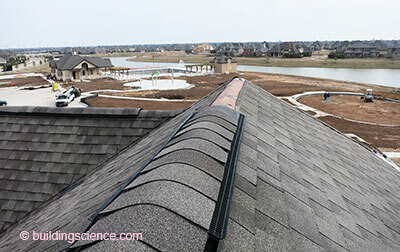 Figure 5: Vapor Diffusion Vent for Shingles—Any off-the-shelf ridge vent works. The only change is covering the vent area cut through the sheathing with a watertight but vapor open covering. A high perm “housewrap” works—over 20 perms. 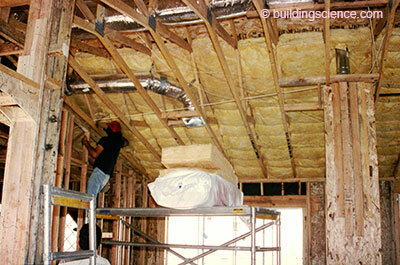 A high perm exterior sheathing such as fiberglass faced gypsum board also works as a vapor open covering. 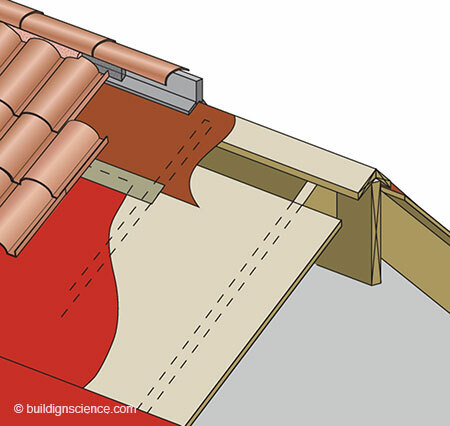 Figure 6: Vapor Diffusion Vent for Tiles—Works with tiles too—it's the same slot used for typical vented roofs, except covered with vapor open membrane. Figure 7: Vapor Diffusion Vent for Hips—Just need the upper 4 feet of the hip to be diffusion vented. Can this work for a cathedral ceiling yes. Check out Figure 8. Does this work everywhere? 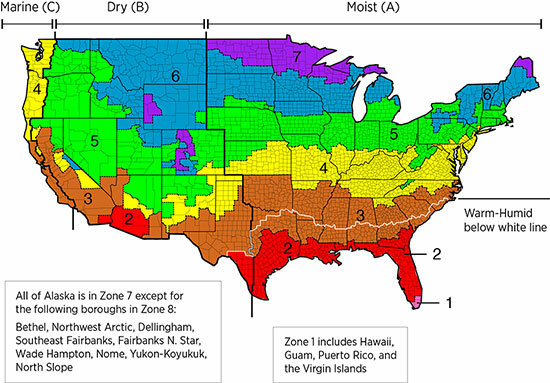 Sure about DOE/IECC Climate Zones 1, 2 and 3 (Figure 9). Pretty sure about Climate Zone 4, but need more work to be sure. Climate Zone 5 and 6 need a lot more work. Lots of weatherization dense pack cellulose experience to draw on. But need to be cautious here. Confident we can make it work but the details need to be worked out. Need a year or two more. Figure 8: Cathedral Ceiling Vapor Diffusion Vent—Yes, it works for cathedral ceilings. We learned this from our Chicago work. Figure 9: Map of Climate Zones—For the time being let’s limit this to Climate Zones 1, 2 and 3. Moist, dry or marine all work. Good experience in the hot and humid south and the hot and dry south—we know what works there. Check out Photograph 8, Photograph 9 and Photograph 10. Typical ridge vent installation practice. 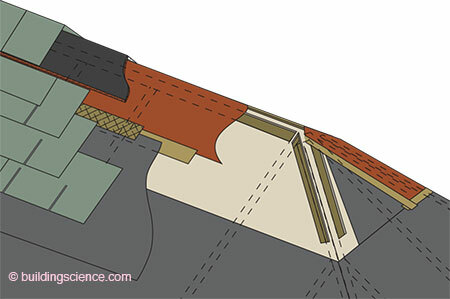 Only change is the vapor open membrane closure—and the ventilation slot down the upper 4-feet of the hip. No special products need to be developed. Everything needed is off-the-shelf. Works with fiberglass bats (Photograph 11). Works with netted cellulose (Photograph 12). Works with adhesive spray applied fiberglass (Photograph 13). Works with fiberglass blown into a netted semi permeable sheet (Photograph 14). 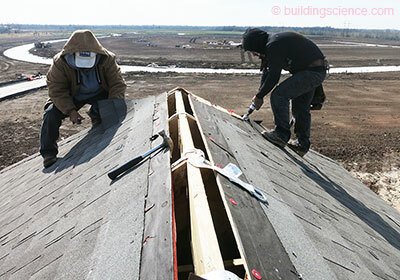 Photograph 8: Vent Opening In Roof Sheathing—Standard construction practice is used to provide vent opening at ridge area. 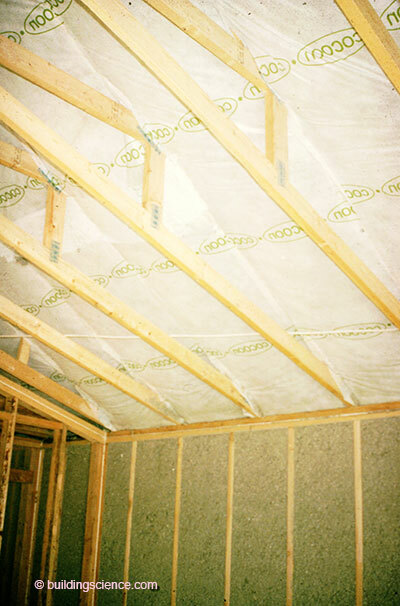 Photograph 9: Vapor Open Membrane—Commercially available house wrap/building wrap used to cover vent openings in roof sheathing. Photograph 10: Ridge Vent—Off-the-shelf shingle covered ridge vent works just fine. Photograph 11: Fiberglass Batts—Works with fiberglass batts. Photograph 12: Cellulose—Works with netted cellulose. Photograph 13: Adhesive Spray Applied Fiberglass—Yup, works here as well. Photograph 14: Blown Fiberglass—Works with fiberglass blown into a netted semi permeable sheet. We need one more thing. Remember “BSI-077: Cool Hand Luke Meets Attics”? We need to condition the attic - we need the attic to be part of the house. We need to supply air to control the moisture in the attic space in the same manner in which we control moisture in the rest of the house. Air change. We need to supply air to the attic. We have been using a supply air duct off of a typical ducted air conditioning system. We have found that 50 cfm for each 1,000 ft2 of ceiling area works. For the time being limit this to Climate Zones 1, 2 and 3. Works in the humid south, works in the dry south. Works in the marine south. Works in the south. The south wins. 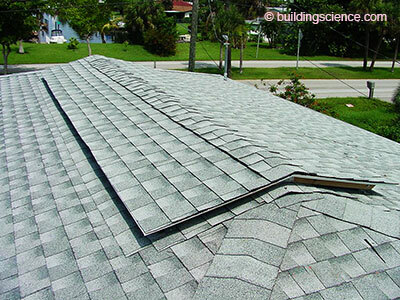 The vapor permeance of the ridge vent covering needs to be at least 20 perms. Where does this come from? Field measurements. We have been as low as 20 perms in Chicago. Chicago is Climate Zone 5 and we humidified the attic space in our test attic. Stressed it big time. But we were too close to the edge in Chicago. There are no issues with 20 perms in Climate Zones 1, 2 and 3. Chicago ain’t easy. We need a sloped roof. Buoyancy baby—thermal or hygric or whatever. At least 3:12. And we need supply air to the attic. At least 50 cfm for each 1,000 ft2 of ceiling area. It doesn’t need to be continuous. The typical duty cycle of you're A/C handles this. Not bad, eh? Not too bad at all. None of this would have happened without the support of the U.S. Department of Energy’s “Building America Program” and a couple of really special big time homebuilders: David Weekley Homes and K. Hovnanian. And Andy Ask of Ft. Myers, FL, who let his house be the subject of a weird experiment. And of course the failures in Juneau, AK. 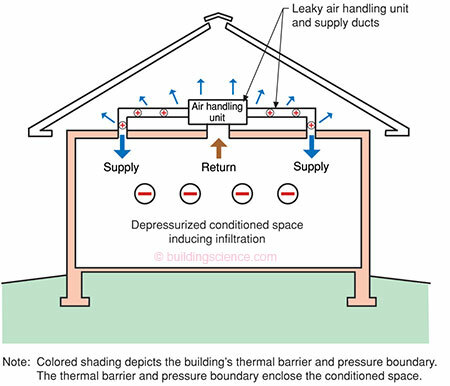 “Field Testing Unvented Roofs with Asphalt Shingles in Cold and Hot-Humid Climates”, Ueno, K and Lstiburek, J., Building Science Corporation, June 2015. Sure would be nice if someone came up with a snap together airtight super insulated duct system that costs less than a Porsche. Yeah, I know there are few that exist, except for the Porsche part. Personally, I think the industry has either solved or is well on the way to solving the blowing agent green house gas issues, the fire retardant issues and the contaminant off gassing issues. I have SPF in my own house, the basement and my attic. I recommend it all the time. If you do creative accounting and forget about the energy needed to make stuff. Ah details and the Devil. I am pretty sure Mies or Flaubert did not have this in mind. Hat tip to Joe Nagan, a big time cheesehead, and good friend. The current codes require 1:300 with half the vent area down low and half the vent area up high. When you get rid of the vent area down low, the vent area up high is 1:600.